At WeCOACH, one of our top priorities is making sure that we are advocating, advancing and supporting women in the coaching profession, from collaborating with others on research to sharing timely topics, we are here to support your career – and to make a difference in your life. Data tells a compelling story and we are here to share important data with you. Do you have a research request? Read more about our policies and how to submit a proposal here. WeCOACH and the Tucker Center for Research on Girls and Women in Sport launched a series of collaborative, cutting-edge research initiatives to help increase the number of women in the coaching profession. The percentage of women coaching women’s teams at the collegiate level has declined from over 90% when Title IX was passed in 1972 to near an all-time low today of 41%. Staggering when you consider that female sport participation has grown exponentially during the same time period. To help stop this decline, increase the percentage of women in the coaching profession, provide an institutional accountability mechanism, create awareness, and start a national dialogue on this issue, we have collaborated with the Tucker Center to launch a research series and annual Report Card. 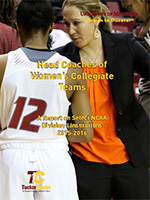 Read the reports to learn more about the historic decline in the percentage of women coaches, why this research and women coaches matter, how minority status in the workplace can affect individuals, and see which “big time” NCAA Division-I institutions, sports and conferences receive passing and failing grades based on the percentage of head women coaches of women’s teams. This longitudinal research series, now in its sixth year, is a partnership between the Tucker Center for Research on Girls & Women in Sport at the University of Minnesota—the first research center of its kind in the world—and WeCOACH. This report focuses on seven NCAA Division I conferences. In our first four years of the report, we primarily examined a sample of “big time” FBS Division-I athletic programs, but were repeatedly asked how the data translated to the Division-III level. In this report employment patterns of head coaches in all Division-III women’s athletics programs at all institutions and conferences is provided. Race and gender data for head coaches of women’s teams was collected for eight select NCAA Division I conferences. Conferences were assigned a grade for race and a separate grade for gender, and recognition was included for LGBT inclusion practices at the institutional and conference level. of Minnesota—the first research center of its kind in the world—and WeCOACH. This report focuses on a select segment of NCAA Division I institutions. Division-III level. This report aims to fill that gap. 2015-16 Head Coaches of Women’s Collegiate Teams: A Report on Select NCAA Division-I FBS Institutions. This annual report, specifically documents the percentage of head coaches of women’s teams in “big time” collegiate athletics by institution and sport. 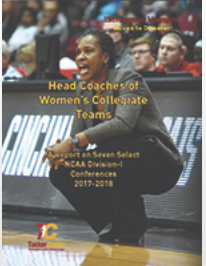 2014-15 Head Coaches of Women’s Collegiate Teams: A Report on Select NCAA Division-I FBS Institutions. Check out the accompanying infographic, the 2014-15 Infographic: The Status of Women in Collegiate Coaching: A Report Card. See which NCAA Division-I FBS institutions receive passing and failing grades. Read Christine Brennan’s USA Today coverage of the 2013-14 report launch. 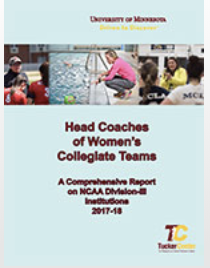 This annual report specifically documents the percentage of head coaches of women’s teams in “big time” collegiate athletics by institution and sport. See which NCAA Division-I FBS institutions receive passing and failing grades! 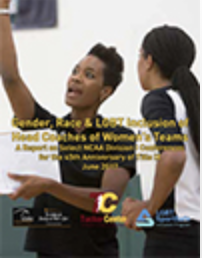 A bi-annual report that documents the percentage of women coaches of women’s teams in “big time” college athletics by sport, conference and institution.